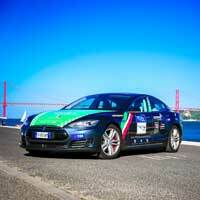 The Tesla Bianchi drove for her trip, as seen in Lisbon, Portugal during the 80-day adventure. ST. LOUIS - When Carolina Bianchi graduated from Webster University at its Geneva, Switzerland, campus in 2015 with a degree in media communications and a minor in psychology, she hoped to land a job in the world of motorsports. So when the opportunity to drive around the world in an electric vehicle and write about the experience presented itself, she jumped at the chance. For 80 days, Bianchi drove through 20 countries on three continents, logged 29,000 kilometers (about 15,500 miles), dodged tornadoes, had a gun pulled on her by a truck driver, and navigated highways that were “roads” in name only. And she would do it all again, she said. Bianchi and her father were the two members of “Team Italia.” They both shared driving duties. Bianchi acted as the photographer and communications manager and her father was the captain. Nine other teams also signed up, representing China, USA, Spain, Czech Republic, Austria, two teams from Germany, and two teams from Switzerland. All drove Teslas except for the team from China, which drove a Denza, an electric car made in China. The teams agreed to follow pre-set routes and to have their vehicles flown across the Atlantic and Pacific oceans, when they reached the end of a continent. The expedition launched in Barcelona, Spain, on June 16. Bianchi and the team averaged 300 to 650 kilometers per day (about 200 to 400 miles per day). Since a Tesla’s average range is about 400 kilometers, one of the challenges was finding places to recharge their car. In Europe and the eastern coast of China, this was easy, Bianchi said, as all had access to plugs that were compatible with the Tesla “Supercharger,” the quick charging kit. Using those plugs, a car could be recharged in less than an hour. While the scarred roads of western Asia were challenging, the scariest moment of the trip happened in the heart of the United States. On June 29, the team was between Kansas City and Denver when their air conditioning system broke down. The day was hot and humid, so the team found a shady spot behind a parked semi-truck. One of the German teams also pulled in to help with repairs. After a few moments, the driver of the semi-truck exited his vehicle, pulled out a handgun, pointed it at the team members and yelled at them to get out of the area. “Extremely frightened and trembling, the front parts of the car were quickly put back together and we escaped immediately,” Bianchi said. When they weren’t dodging tornados or running from emotionally unstable truck drivers, much of their non-driving time was spent talking to groups of people along the way about sustainable driving. Other stops included a tour of the Tesla factory in Fremont, California, several sustainability events in China and Bucharest, and a reception organized by His Royal Highness Prince Albert of Monte-Carlo. The team finished the trip on Sept. 4 in Barcelona, taking exactly 80 days. Since then Bianchi has enrolled in graduate school in sports management. But she would like to try a similar trip in the near future, preferably one around the southern hemisphere, through Australia, New Zealand, South America and Africa. To see her daily dispatches and more photos of the trip, visit the team’s Facebook page at https://www.facebook.com/80edaysteamitalia/. To learn more about the 80edays challenge, including seeing a map of the route used by the vehicles on the challenge, visit http://80diaselectricos.com/.